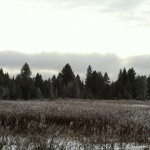 The pines and wildflowers are frozen with ice left from a low morning cloud. Snowfall and gray skies tell of winter. The empty boat slips and canopy frame remain as reminders of summer. 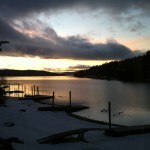 Winter sunrise over Coeur d’Alene … greeted by the ducks. 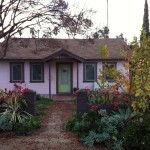 The little pink house in December, with winter color Los Angeles style. Red grape leaves and orange-yellow sycamore leaves bring winter color to December. Pecan tree and stone fruits have lost their leaves, and irises are pushing up for spring blooms. Last year I toured several environmentally focused schools to learn how innovative programs are addressing Nature Deficit Disorder: the growing issue of children (and adults) lacking enough access to nature and its restorative qualities. At one of the public elementary schools, remade with native gardens, fruit orchards and vegetable gardens, I sat in on an outdoor classroom session while the children learned about seasons. They were in second grade. “What is spring?” the teacher asked. She held a stack of illustrations on her lap, ready to hold them up as the children correctly described the seasons. The children were fidgeting in their seats, and looking out into the garden that surrounded us. “Flowers!” A child called out. 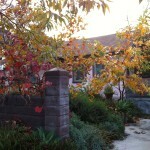 It was September, and flowering vines, leafy greens and fruit trees filled the garden. The sun warmed our backs and butterflies floated around us dreamily. “That’s right,” the teacher responded, and held up an image of spring flowers with birds and bright green leaves. “What is summer?” she asked, putting the card down. “Hot!” another child called out. The children thought about it for a bit, looking around at each other. “That’s spring,” said the teacher. “What is fall?” She looked around at the children, willing them to think about crisp fall leaves in myriad colors. They sat staring into the garden, full of fruits and vegetables and flowers. This was fall in Los Angeles. Another season of growth with blooming sages, sweet lettuces and fruiting trees. My own garden was still waiting for the winter rains to freshen it up a bit after summer’s long, dry death march on the grasses and perennials. California gets its nickname “The Golden State” for the golden hillsides of summer – another anomaly according to our preconceived notions of seasons. Summer should be lush green grasses and thick-leaved trees as it was in the hot and humid Midwest and Southeast where I grew up. “Because we don’t really have seasons in Los Angeles. It just gets a little colder and a little warmer.” His answer surprised me, because he is my nature-loving science guy. He spends hours outside each week hunting for snakes and lizards and interesting bugs, and tells me about what he observed outdoors. I figured he, of any child, could mete out an understanding of our seasons. 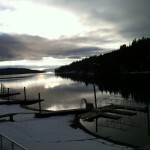 I spent this Christmas in Idaho with my 16-year-old, my sister and my mom. We flew into Spokane and were met by a near whiteout. As we headed east on the freeway traffic got slower and slower with the thickening snow and ice on the asphalt. Big flakes rushed into our windshield, giving us the white winter I have longed for since moving to Los Angeles ten years ago. We spent five days of bliss in our winter wonderland, tromping through inches of crusty snow and marveling at our frozen breath before heading inside to warm ourselves by the fire. Ah, winter! 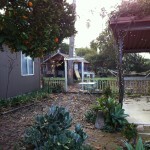 When I flew back to Los Angeles on Christmas Day, I was greeted by 80 degree temperatures and my Orange Tree heavy with fruit. I spent the next day weeding, since the winter rains had encouraged unwanted annual grasses to sprout amidst the yarrow blossoms and greening buckwheat branches. Winter days in Los Angeles sometimes felt like spring or summer or fall. And summer sometimes feels like winter. When I first moved to Los Angeles in June of 2003, my sixteen year old was just six years old. He spent the first six weeks of summer staring up at me in disappointment at the gray mist that had earned the term “June Gloom.” I had promised him the eternal sunshine that Southern California was famous for, not knowing that we would leave the two-month deluge of that North Carolina spring to enter the famously un-sunny summer of Los Angeles. How many of our children are confused by the seasons we teach them in school? What better way to teach children about weather and seasons and climate than to send them outside into natural schoolyards or parks and let them record their own observations over time? This could give them the opportunity to explore and appreciate the feel and scent and sounds of the seasons while giving us a place by place accounting of the local weather. We could set up a national or international database for schoolchildren to record their observations of the temperature and the local ecology: what plants were blooming or dormant, what birds and creatures did they see, what colors were the leaves, how much snow or rain clouds or smoke or dust was in the air? For 114 years, Audobon has conducted an Annual Christmas Bird Count, the longest running Citizen Science survey in the world. Why not a Student Season Survey for students to record their daily observations of the seasons? There is a unifying theme of winter. In Idaho and So Cal, New York and Ohio, Tucson and North Carolina, long nights infringe on our lives and darken our waking hours and moods. Winter work days end after dark here, albeit a couple hours later than the 3:30 sunsets in northern Idaho. The winter solstice sends us all searching for light to brighten our spirits as well as our nights. My son lit fire after fire in the Coeur d’Alene cabin’s pot-bellied stove over Christmas. On my return to Los Angeles, I drove my mom and son around Eagle Rock and Highland Park in search of our favorite holiday lights. Whether warm or cold, desert or mountain, northern hemisphere or southern, winter means darkness.